A guest post by London Historians Member, Sue Sinton Smith. During the early 20th Century Canning Town had the highest multicultural population in the country. 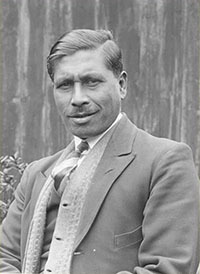 Kamal Chunchie, born in Ceylon, came to England to fight with the Middlesex Regiment during the First World War. After the war he settled in Canning Town and, appalled at the discrimination experienced by black and Asian people, decided to establish somewhere they could socialise as well as to get advice. Chunchie rented a former Chinese boarding house which had hosted opium dens in the basement and moved in with his family. He wanted somewhere Black and Asian people could feel safe and learn, as well as hear the word of God. Chunchie, born a Muslim but converted during the War, was ordained as a Minister in the Methodist Church. He spoke eight languages and sometimes preached in six different languages at the same service! The church wanted to send him abroad as a missionary but he refused as he felt, like Dr Barnardo, that there was so much to be done here. The Institute was funded by the Methodist Church, supplemented by donations from friends and Chunchie himself. It was open from nine in the morning till 10 at night and had a billiard room, a newspaper and writing room and a prayer room. It provided food and shelter to seamen and gave out food and clothes parcels to poor families and provided Christmas dinners, as well as running outings to the seaside. Sadly it was not to last. After just five years, the building was demolished to make way for the new road to the docks in 1930. Chunchie might have been able to re-establish the Institute in another building but by this point funding had been withdrawn by the Methodist Church. This could have been due to Chunchie’s lifestyle. He was a smoker, drinker and gambler and didn’t feel his position as minister meant he should compromise his enjoyment. He carried on travelling around the country, preaching and raising money for the people he supported, unable to move into a new building before his death in 1953. Mission accomplished. As explained in the previous post, the final public opening (until 2018) of Pitzhanger Manor in Ealing last Saturday rendered imperative my long-delayed Sir John Soane walk from Sir John Soane’s Museum in Lincoln’s Inn Fields to Ealing. Soane bought Pitzhanger in 1800, re-built it until 1804, then sold it in 1810. 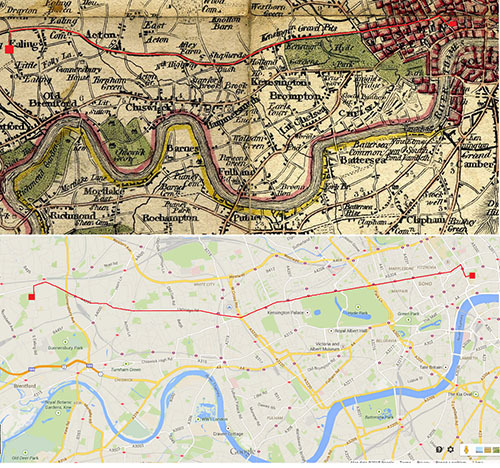 Below is an 1800 map and the current route from Google. It is very little changed, the Oxford Street-Bayswater Road – Uxbridge Road axis being a major westerly trunk road today as then. I love the idea of doing long walks. It’s good exercise for a start if you can tolerate the traffic pollution (I can). It is essential to give the historian a sense of what life was like before trains and buses. There were carriages, of course, but even successful men like Soane, John Quincy Adams and William Hogarth often chose to take a bracing walk between town and country, or vice-versa. Most of all, you see things that you never would by car or by bus and, obviously, on the Underground. Apart from the map work, I do very little research beforehand. The surprises are all the better that way. There were lots. I particularly enjoyed seeing two Passmore Edwards libraries, in Shepherd’s Bush and Acton (my admiration for the Edwardians and all their works increases every time I explore like this). 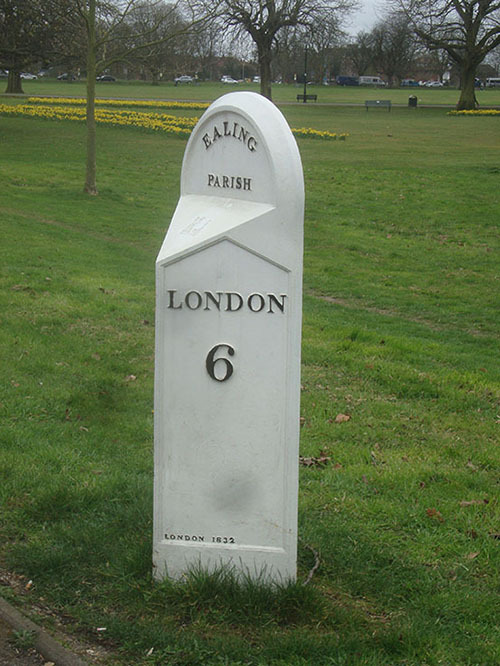 It was nice properly to inspect the old milestone in Ealing rather than to squint at it stuck in a traffic jam. Below are some photos. Check the much larger set on Flickr here. Next we’ll do a Hogarth walk from Leicester Square to Chiswick. My thanks to fellow London Historians member Deborah Metters (@rosamundi) for her excellent company on this odyssey. 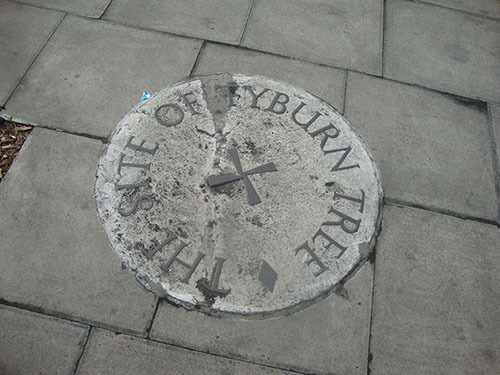 The site of the Tyburn scaffold. Apparently. 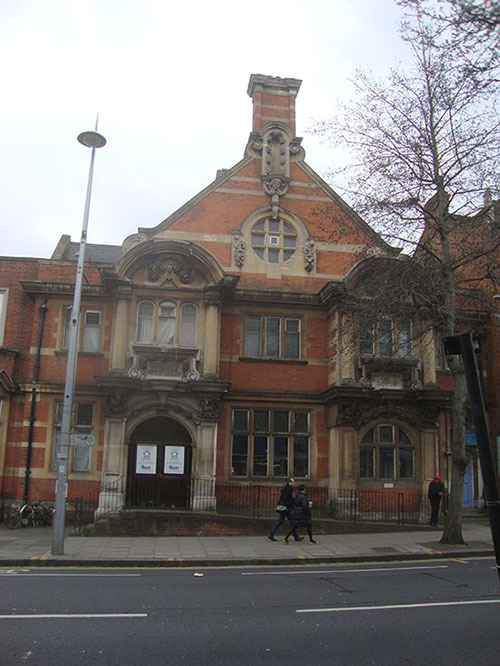 Passmore Edwards Public Library, Acton. 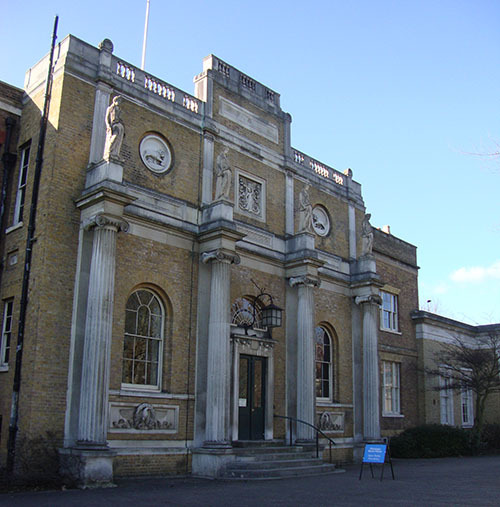 The architect John Soane purchased Pitzhanger Manor from his own mentor George Dance the Younger as a country house for his family. He bashed down most of it and built a new one more to his liking. It’s a wonderful building which I love visiting. It has recently closed for major Lottery Grant refurbishment and will remain so until 2018. Except for tomorrow, when it will open to the public for the last time and when we will be allowed to access areas where we’re not normally allowed. So don’t miss the opportunity. Soane was known to enjoy walking from his town house in Lincoln’s Inn Fields (today’s Sir John Soane Museum) to Pitzhanger, some 8 miles, I reckon. Tomorrow I plan to re-enact that, starting at about 10am. If you fancy joining me, please send me an email asap. We’ll stop at the Churchill Arms in Kensington Church Street and go to the Red Lion, Ealing afterwards. 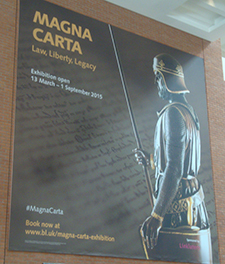 Magna Carta: Law, Liberty, Legacy at the British Library 13 March to 1 September 2015. Did you know that in 1941 Churchill and his war cabinet discussed presenting the USA with an original copy of Magna Carta as some sort of sweetener to induce them to enter WW2? The document in question wasn’t even in their gift, belonging as it still does to Lincoln Cathedral. Desperate stuff, in retrospect, but perfectly true. 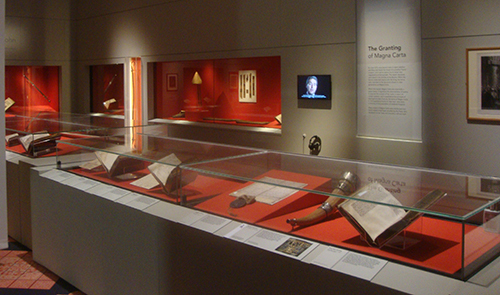 The documents pertaining to this incident are on show in the 20C part of this new exhibition on Magna Carta at the British Library. The show, of course, commemorates the 800th anniversary of that totemic, world-famous historical document. It is the biggest such show ever staged. On show too are many other documents of similar or even greater moment. As you’d expect we have original copies of Magna Carta from 1215, two of them: the Canterbury, which is virtually illegible except with specialist laboratory science viewing instruments; and the London. Missing are the Lincoln and the Salisbury which were united with the others in London for about a nano-second last month. But this matters little, for in addition we have several dozen other historical rights documents which – it can be argued – are as or more important than Magna Carta itself. These include the American Declaration of Independence, in Jefferson’s own hand; and the original American Bill of Rights. These have a security guard on them at all times, quite probably a condition of the loan from across the Pond. On show is also our own original Bill of Rights from 1689. But re-wind to the 13th century and there are rights documents which pre-date Magna Carta and ones which over the next 100 years or so re-new and reaffirm the bargain between the English monarch and the free men of his Realm, of whom there were relatively few early on. But the important thing is that these deals led to more and more important, egilatarian and ultimately democratic agreements between the rulers and the ruled. 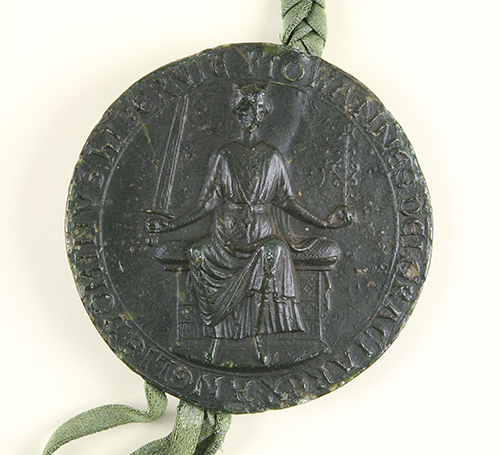 Magna Carta, which was more properly known at the time as the Articles of the Barons on the Charter of Runnymede (“Carta de Ronemede”) led to the Forest Charter of 1225, the 1297 Statute Roll and the 1311 Ordinances of Edward II. Inexorably on through the English Bill of Rights, American Independence, women’s suffrage, universal suffrage, colonial independence movements and to the 21st Century and Burma’s Aung San Suu Kyi. The exhibition proceeds through all of these which are represented though a collection of well-chosen objects from swords to cartoons to commemorative teapots. 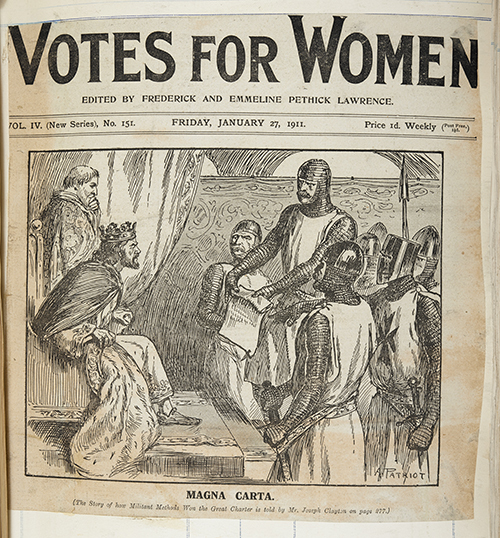 Votes for Women, 1911, British Library. Many of our favourite freedom-fighters, politicians, martyrs and charlatans are represented here. 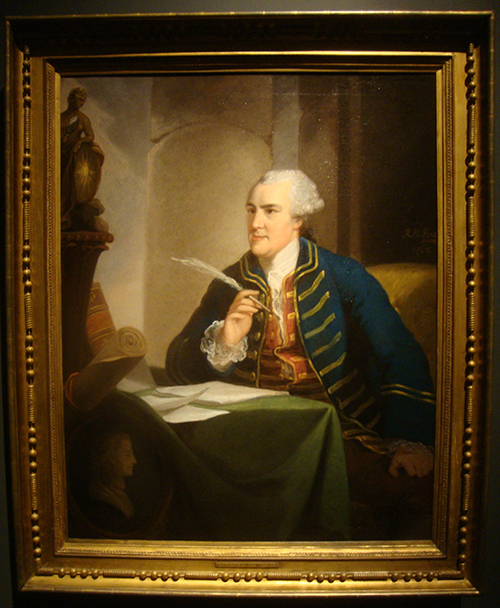 Mine – John Wilkes – was, of course, all of these things. He certainly invoked Magna Carta in his time of need. The structure is essentially a game of two halves. Magna Carta in its own time and the key players who seem almost like pantomime characters to us now: King John, the French King Philip Augustus, the great medieval pope Innocent III, archbishop of Canterbury Stephen Langton, noteworthy troublemaker Simon de Montfort. But this was no panto. Supported by beautiful illuminated books from the Royal Collection and elsewhere, along with body parts of the King, seals, tally sticks, clerical vestments, this part of the show gives us the why and the how, the political and social landscape: the context. And it does it brilliantly. 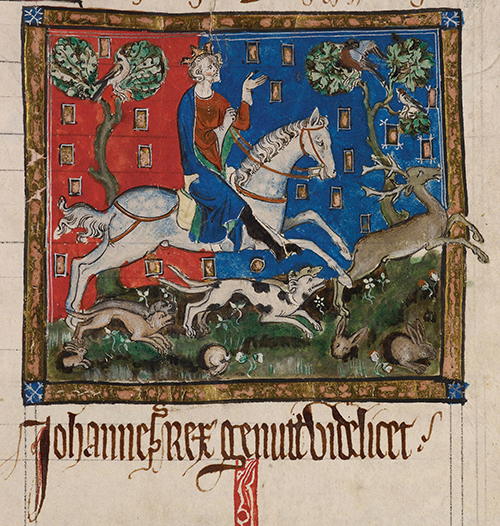 King John hunting a stag with hounds, 14th century. British Library. The second half gives us, as we have noted above, the effects and influences of Magna Carta in the centuries following, down to to-day: how Magna Carta burst its own banks, so to speak. For as we are shown, Magna Carta was almost immediately quashed by Pope Innocent III, making it redundant. And while it has been superceded by greater acts and charters, all but three of its own clauses have been repealed. But what clauses they are. 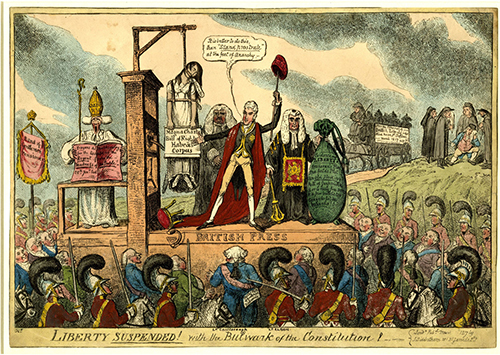 They involve the exclusive rights and privileges of the Church; the exclusive rights and privileges of the City of London; and most importantly of all the right of any free man not to be arrested without reason or to be tried except by his own peers. Finally, though, the show includes unobtrusive (ie via headphones) video of academics and politicians giving contextual commentary. I’m usually wary of this sort of thing, but these are very good indeed. 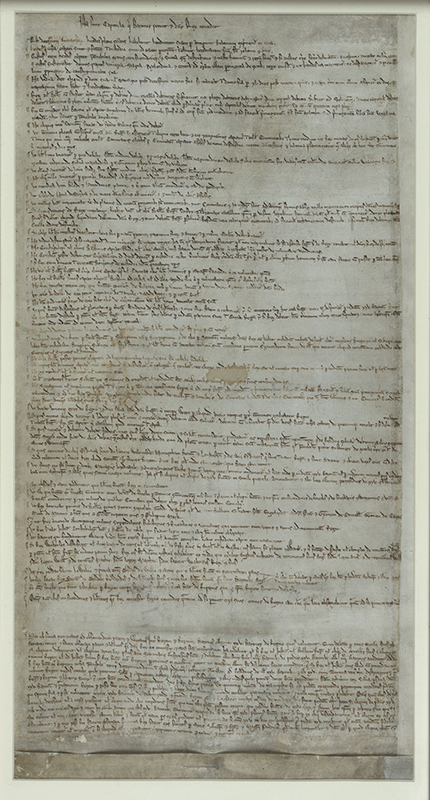 Magna Carta London copy, 1215. British Library. This is a substantial show, a thoughtful show, the equal of the heady topic it represents and brilliantly executed. Standard ticket price is £12 and worth every penny. I’m delighted that under 18s go free, for these are important matters for young minds to know about and to think about. It’s not the end of March yet and I may already have seen the London exhibition of 2015. 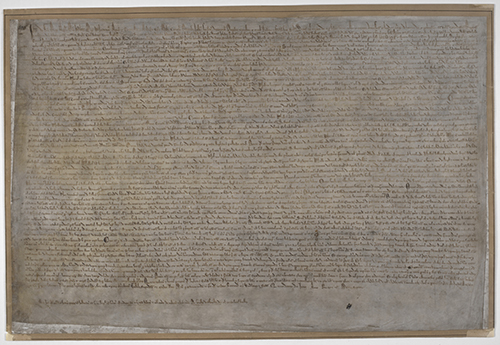 Check out the British Library’s special web space for Magna Carta 800. You can book your tickets from there too.